Make a stunning heirloom quilt and learn over 35 creative machine techniques in the process. This award-winning heirloom quilt has been specifically designed to explore sewing machine techniques for fabric embellishment and manipulation. It is comprised of nine beautiful panels, each of which is described in step by step detail. It showcases exciting decorative skills such as wavy corded tucks, smocking, machine lace and cutwork. It also features a number smaller sewing projects including a cushion using the trapunto technique and Christmas stocking with smocking detail and a bag made using corded wavy tucks. 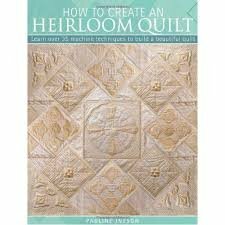 Whether you want to learn new techniques or brush up on your quilting skills, the comprehensive step-by-step technique advice and invaluable tips and tricks will help you along the way. Stylish photography and easy-to-follow layouts complete the package, making this book essential for anyone who wants sophisticated results from straightforward machine techniques.